Physician burnout and mental health have been on my mind lately. Considering the many articles I’ve read recently on these topics, I’m sure it’s been on your mind too. I’m part of an initiative at my organization to address physician burnout and improve wellness among staff, both at the individual and systemic levels. I find this recent article on Kevin MD an interesting idea. Given all the metrics we tailor our system to based on patient care, safety and satisfaction, it’s an innovative twist to ask that our wellness, or lack thereof, be a goal marker as well. Ultimately, our well-being affects how well we care for our patients and even their outcomes. The cynical part of me thinks the only way we can really get our healthcare system to change and address the epidemic of physician burnout is to tie those levels to dollar signs. There is a strong argument for the financial benefits of physician wellness and many organizations seem to be acknowledging that reality and investing more in this issue. As mothers and physicians we’re used to putting others’ needs before our own. But I’ve realized over the years that I’m a better caregiver - to my children and to my patients - when I’m practicing good self-care. In the world of healthcare though, systems need to be in place to support that ability. What are your thoughts? What has been successful or not so successful at your organization? Has your workplace found ways to encourage not only personal resilience but also support an organizational culture of wellness? It's hard to believe, but this month marks Mother in Medicine's 10th birthday. It's been a great 10 years! We are honoring the occasion with a Mothers in Medicine Book Giveaway. To enter, just send an email to mothersinmedicine@gmail.com with the subject line: MiM Book and we'll select 10 random readers to receive a copy of the book. Deadline to enter is Monday, June 4. Come write with us for a year! Each year, we open up a call for new writers to join as blog contributors. It's a chance to write, reflect and help the MiM community by sharing your stories. If interested, send an email to mothersinmedicine@gmail.com with the subject line: Call for Contributors and tell us a little about yourself and why you would like to contribute. Deadline is Monday, June 4. Thanks for reading, commenting, writing, sharing. Here's to 10! I recently put together a panel for the AAMC Continuum Connections conference (a joint meeting of student affairs, GME, medical students, and residents) on Supporting Parent Learners Throughout the Continuum. The goal was to discuss the unique needs of our parent learners, identify gaps in support, and share best practices. We had a fantastic panel including a medical student dad, an OB/GYN fellow mom, a student affairs dean, and a former PD/central GME leader. The 1 hour 15 minute session was clearly not enough time. We could have filled 2 days with the discussion. I loved that so many people had chosen to come and think about these issues and the panelists' personal experience and perspectives were insightful. One institution holds spots in a local daycare for incoming PGY-1s since the process can take so long and there can be too little time to secure ones after Match Day. Love this idea. One school holds a welcoming event for medical student parents and their families to get to know each other right from orientation. And I shared the upcoming event at my house: babysitting for medical student parents so they could have a nice night out together --Parents' Night Out. It was so difficult for my husband and me to share any alone time without a baby on our lap, and it's expensive to hire babysitters, so I wanted to give our student parents some wellness. We had it this past weekend and it was a ton of fun. Students dropped off their kids at our house and I had a small crew of student volunteers who wanted to help. There were five kids total, ages 3 months to 3 years old. We adults outnumbered them -which turned out to be a very helpful ratio to trade-off and allow helpers to eat and take a break. I loved loved loved seeing our medical student parents and their kids. When one couple came to drop-off wearing nice going out clothes and mentioned it was their first date since the baby was born, I think my heart grew two sizes. I also enjoyed getting to know the students who volunteered their time to help on a Saturday night. At the AAMC panel, the former PD/central GME speaker said to the audience: to the younger generations, I'm sorry my generation could not figure it out (in terms of parental leave). It's still an issue after all of these years. But, what I would add to that is that we have certainly made progress. More of us are thinking about how to support our parent learners better, as well as all of our learners. Just having a dedicated session to that during a conference is a start. It was a random Wednesday that I was off from work. I was thinking of the possibilities. Oh the possibilities! I could do my ever piling load of laundry. Replenish the empty fridge. 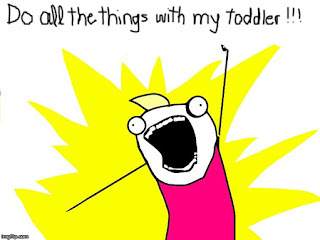 Or forget all that, and keep my toddler child from daycare and spend time doing something fun with him. Since starting intern year, it feels like our time together has became ever so scarce. Today I would make up for all that missed time. 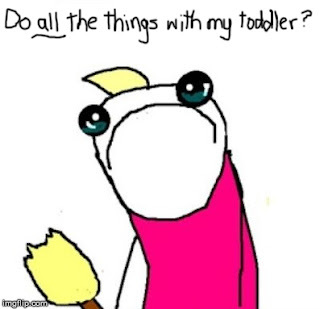 We could go to the playground, do story time in the library, visit the local children's museum. Endless possibilities! First things first, we'd eat some good healthy breakfast to get the day started right. Today I was in no rush. Instead of his usual sugary cereal breakfast, I was going to make eggs and toast. Now anyone who knows my toddler child knows food is a big struggle with him. He reacted to eggs and toast like I had handed him a plate of dog-doo. He put on a whole production. Defiant "I don't wanna". Pushing the plate away. Putting a bite in his mouth followed by gagging sounds. Finally, eating his food in infinitesimally small bites that he would take an absurdly large amount of time to swallow each bite. I was already questioning my decision to keep him home from daycare. I was now fantasizing the alternative of doing laundry in peace. Finally after an hour or so of lingering, pleading, arguing over the table, I just had it! Out came the threat, "Child, you don't like the food here, I'll take you to school where you seem to have no problem eating the food. Forget about the museum or playground". "So you want to finish your food?" "So which one do you want, go to school or go to playground"
"Then you have to eat your breakfast"
Round and round in circles we went. And of course there were lots of tears involved! "Alright then, let me break this down for you. You can go to school. Or you can finish your breakfast and we can go to the playground." Lots more tears. Then he said something shocking! "I want to go to school." I was not expecting this at all. Really!! He wanted to not eat that food so bad, that he would forgo museum and playground, something he normally loves to do! Well, I may have been bluffing a little, we were both in our PJs, not daycare ready. But it was too late to turn back now. I got dressed, got him dressed. All throughout in a shock, asking him several times, "so you want to go to school, not to playground?". Each time, "yes". Alright dear child, as you wish! 'This was incredulous', I kept thinking all the way on our tense walk to the car. Just as I was strapping him into his car seat, he said in a low voice, "I want to eat the breakfast". In my mind, I thought, "Are you for real??? After all this, after I got dressed, got you dressed, after all those tears and drama, now you want to eat breakfast!!!" Aloud I said, "Have you decided for sure?" We walked back to the apartment in silence. He finished his breakfast without another complaint or tear. I'm happy to report, we had a great rest of the day in the playground and museum, of course peppered with occasional meltdowns here and there, but nothing quite so epic.